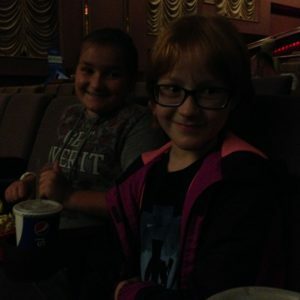 Carter, her friend Emma, Charlie and I went to see the Goosebumps movie this evening. It was great because it’s that spooky time of year, but also because the Goosebumps series is a piece of my own childhood. I loved sharing the jumps and yells and dives for cover with them! When we left, it smelled a little of pee-pants. I believe Charlie literally had the pee scared out of him! 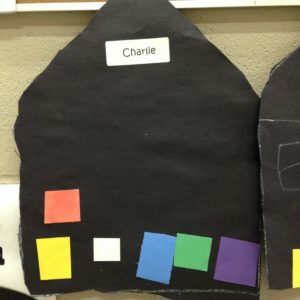 I didn’t worry much about Charlie, other than maybe he wasn’t focusing or picking things up as quickly as peers. With Carter, I was prepared for the worst: Nose in a book, defiant behaviors, inattentive and unproductive learning behaviors, horrid group member, menace to society. Charlie’s doing well! 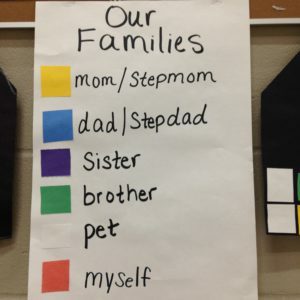 He’s picking up concepts quickly, which we see at home, too. He’s wanting to learning, and loving the process! He can write his first and last name and phone number, knows nearly all of his upper and lower case letters (“b,” “d,” “q,” and “g” still throw him) and numbers (he still has to double check the “tails” of 9 and 6). He can count to 120, and he does great during instruction and group time. Phew! 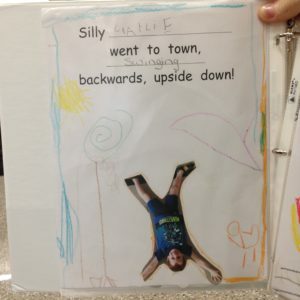 After reading a poem, the class created themselves in “Silly” form. This is “Silly Charlie,” swinging! SO accurate! Carter’s doing well, too. Which is the greatest news I’ve heard in a long time! She’s chatty, and group work is hard, and she doesn’t like to put herself out there for fear of being wrong. But she’s smart, she’s intuitive and creative, and she always start fresh the next day. So, we’ll keep them both.